So many delicious things to eat in this week’s Table Talk, from a new deli in Leamington to a Greek-Cypriot pop-up in Birmingham and sizzling sausages in Shrewsbury.Tuck in! Congratulations to mother and daughter team Jacquie Smallwood and Lauren Castle, who opened the doors to their new deli in Leamington yesterday. Fred & Virginia on Regent Street offers fresh food for breakfast and takeaway lunches as well as pantry items, ready meals, soups, bread and cakes. It will also stock a selection of luxury hampers and gifts. The plant-based deli also plans to hold meet the producer events for sampling artisan produce. Recreate that holiday vibe in the heart of Birmingham, with chef Tim Phedon who is launching his inaugural Greek Cypriot themed pop-up restaurant, Yiayia Mama. On Friday 3rd August Tim will create authentic dishes from the villages of his grandparents in Cyprus, mixed in with creative reinterpretations of some classic recipes. Menus will be themed around mezze, and all dishes – from bread and dips to a Cypriot custard filo pie for dessert – will be homemade. For a sizzling banger, head over to Shrewsbury on Saturday (28th) for the new Sausage and Cider Festival. The team behind the Shrewsbury Food Festival and Shropshire Oktoberfest is staging this one day celebration in the Buttermarket. Entry is £5. Street food trader Libertine Burger has found a permanent home in Leamington Spa, so have set up a kickstarter page to crowdfund their dream of opening their first burger shop. They are taking over what used to be the Aubrey Allez café on Warwick Street and hope to fill the gap left by the closure of Meatcure for a family friendly place to eat great quality burgers. Created by local chef Charles Harris, Libertine Burger started its life 18 months ago serving hungry punters double ground beef patties using the best dry-aged Aberdeenshire beef . Their van has wheeled into the Digbeth Dining Club and a kitchen take-over at The Royal Pug in Leamington Spa. In a short space of time, the burger boys have been a finalist in both the British Street Food Awards in 2017 and in this year’s National Burger Awards. Charles explains “We have travelled all over the country flipping our wares, making sure that our customers know that Libertine Burger is the first word in taste and value. Along the way we have been nominated for some very prestigious awards and even been given spots at the country’s top street food markets. It’s been one hell of a ride, and one that we are not ready to disembark just yet. “Call it serendipity, kismet or destiny, but we have now been given the opportunity to turn our street food dreams into an actual restaurant. And all we need to achieve that goal is your help in raising £12,000 to make sure that our equipment and signage are up to the high standard that our customers have come to expect from us. Libertine Burger is set to open in May, initially from Thursday to Sunday. Check out more on Facebook, Instagram or online. I don’t think that it is a coincidence that the scorching weather is back and the news in my inbox all features beer, so here is a round-up of all things mash-related. Pub and off-licence Ten Green Bottles has expanded by opening its second site in Stone, Staffordshire. Joining the Newcastle-under-Lyme branch, this site stocks more than 60 varieties of bottled beer for people to take away, as well as offering seating for customers to enjoy a beer in the venue. It also serves wine by the bottle or glass and artisan gin, as well as coffee, tea and hot chocolate. Over in Leamington, The White Horse is raising a glass or two to the amber nectar during their Craft Beer Festival. From now until 15 July, the pub will be bringing you an exceptional range of bottled, cask, keg and canned craft beers, plus a range of show-stopping limited edition beers from independent American brewer, Sierra Nevada.There will be beer flights and a loyalty card where for every pint or beer flight you purchase, get your card stamped and your 7th pint is free. And its congratulations to Warwickshire’s own Purity Brewing Company for winning Small Business and Fast Growth Business of the Year at the West Midlands Business Masters awards. Followed by a winning vote for Mad Goose, which was named Best Bitter at the Wolverhampton CAMRA Beer & Cider Festival. If visiting a fine dining restaurant is a little daunting, or you want to make sure that you will enjoy the experience before splashing out, then I’d recommend trying the lunch menu first. Nearly all restaurants offer a fixed price lunch menu, with fewer choices than the evening a la carte menu, to get to grips with a chef’s style of cooking. This was the view of my mum, who hadn’t eaten at Restaurant 23 before, when she joined me for lunch there on Saturday 25 March. While we were reviewing the menu, a platter of freshly made bread with plain and Marmite butter arrived. This is the first indication that Head Chef Curtis likes to play with favours. With three choices of starters, mains and desserts it was quick and easy to choose what we wanted to eat. From Rabbit (with peanut, gherkin and carrot, Mushroom (with pasta, balsamic and parmesan) and Salmon (with avocado, dill, buttermilk) I went for the veggie option. The sweet beads of Balsamic vinegar were almost like berries, cutting through the earthy mushrooms. Then followed an amuse bouche of sweet tomatoes and knobs of mozerrella, which Maitre D Eduardo Nesto poured water into our bowls to make a refreshing, clear broth and imaginative change from sorbet as a palette cleanser. For mains our options were Chicken (with swede, maple, and kiev) Pollock (with baby gem loveage seaweed) and Egg Yolk (with celeriac, burnt onion and watercress). Traditional roasted chicken melted in the mouth, the Kiev ball was deep fried to crisp perfection and the sweet maple syrup and swede alongside creamy mash were a winning combination as far as my mum was concerned. Eduardo was back to pour jus over mum’s chicken and a (I think) a lemon sauce over my pollock which made the loveage and seaweed crackle into life. Always leaving room for dessert, Mum was straight onto the Raspberry meringue, sorbet and panna cotta without giving the Egg custard (with nutmeg and Yuzu) or Chocolate (with biscuit, clementine and fennel) a second look. Facing competition from numerous branded chains as well as independent venues, Restaurant 23 is offering an exceptionally good value two course lunch for £19.95 or three courses for £24.95. On Sundays the prices are higher for lunch, at £37 for two courses and £45 for three courses. I must make a special mention for Eduardo, who deserves a medal for the tact, diplomacy and charm in dealing with a non-eating toddler and a couple who wanted to order from the (unavailable) evening tasting menu for lunch. What a star! I’d sum Restaurant 23 up as elegant without being intimidating and creative but not scary cooking making it a must visit eaterie. Find out more about Head Chef Curtis Stewart here in the latest Meet the Chef article. I am sad to hear that one of my favourite local chefs is on the move. After ten years as Chef Proprietor of Restaurant 23, Peter Knibb will be leaving the Leamington Spa restaurant and handing over the kitchen to new Executive Chef Curtis Stewart. Curtis hales from Bury in Manchester, and has spent the bulk of his career in award-winning kitchens at The Vineyard, Whatley Manor, Cowarth Park, The Feathered Nest, The Painswick Hotel and most recently at Quill. His vision is to produce modern, innovative food that tests and delights the senses. The Georgian townhouse at 34 Hamilton Terrace is home to a dining room, two private rooms, Morgan’s cocktail bar and patio terrace. Restaurant 23 is open Tuesday to Saturday for lunch, afternoon tea, pre-theatre supper and a la carte dinner. If you haven’t already tried this three AA rosette restaurant add it to your list now! 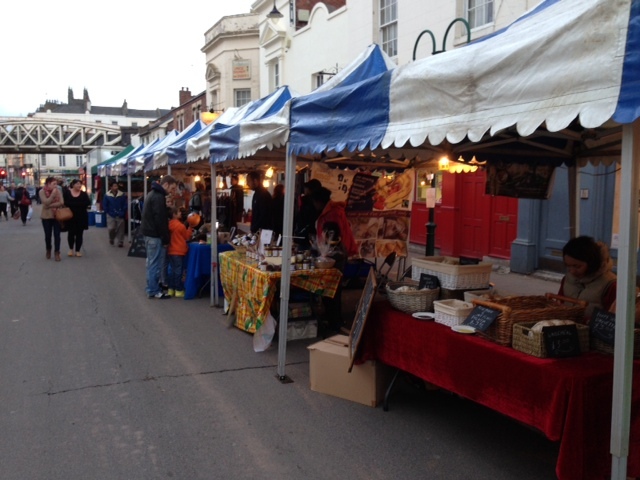 If you’ve been to Eat Street in Leamington Spa (the Friday street food feast) you will have come across CJs Events who manage this weekly market. 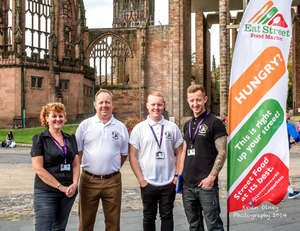 They are a family owned, local company with a passion for food events who are celebrating being awarded a tender from Warwick District Council. 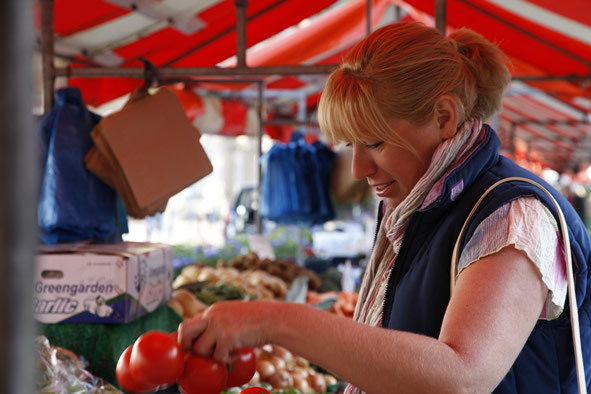 Starting from 1 February, the company will host the weekly food markets in Leamington Spa and Kenilworth as well as the monthly Warwick Farmers Market. 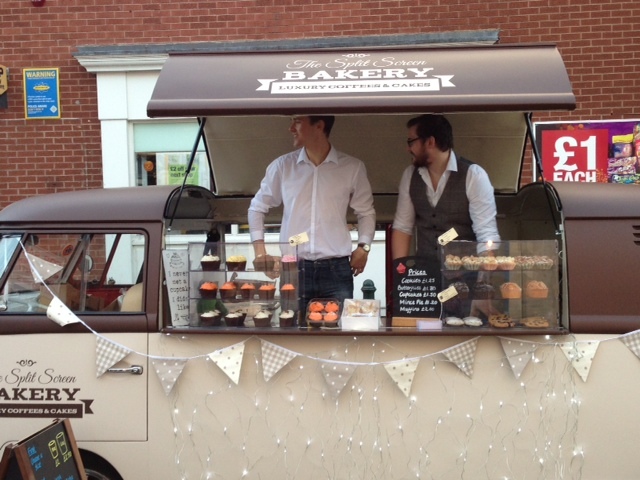 The markets relaunch in February so dates for your diary are Thursday 5 February in Kenilworth and Saturday 7 February in Warwick, with Eat Street in Leamington set to return in March. Who are Haddie & Trilby? They are the baby elephants of Sam Lockhart’s Victorian circus, who performed in Leamington Spa 150 years ago. See, you learn something new every day. They are also now the charming logo of a new bakery opening on Saturday. The baker at Haddie & Trilby is George Casey, a man, it’s fair to say who loves his food and loves bread above all. His house is home to a Bodliean library of cookery books, a fridge stuffed full of live yeast starters, his garden centre-piece the handmade wood fired pizza oven where hand spun sourdough pizzas blister and bake in moments. 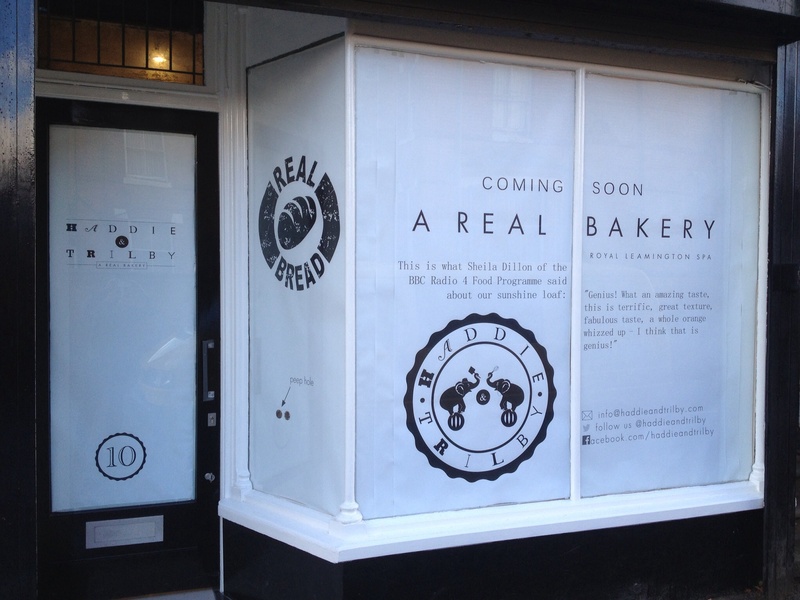 Now he’s going to be proving, shaping and baking real bread for you at 10 Regent Street, Leamington Spa. 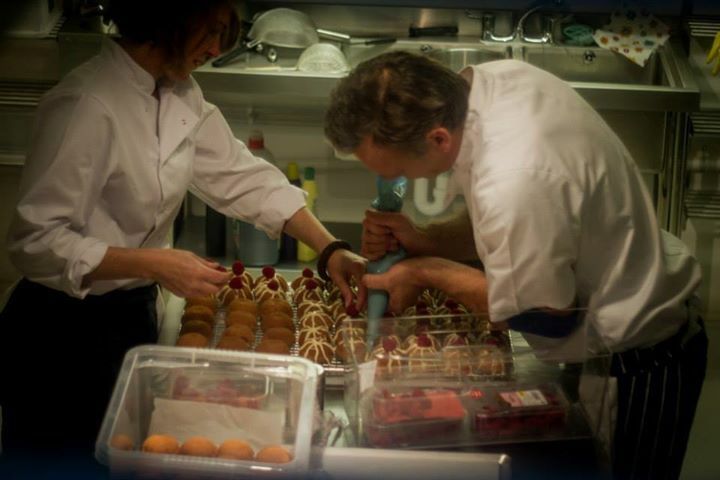 Just a year ago George was behind a different kind of mixer, he crafted programmes for BBC Radio but the desire to bake was never going to go away, so George decided to re-train at the School of Artisan Food. Haddie & Trilby will craft everything on site by hand, with no short-cuts or cheats. All of their bread will be slowly fermented, taking a minimum of twenty four hours to create. 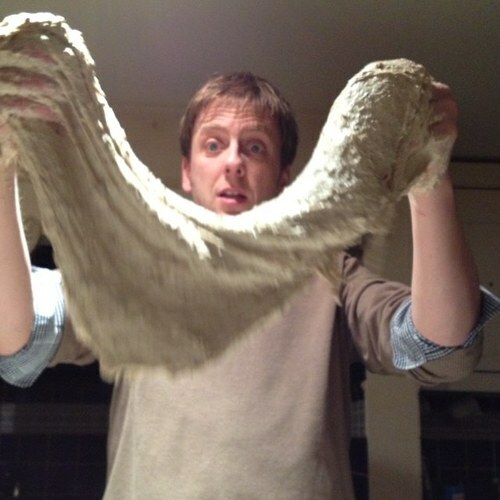 George says “We received our first flour deliveries from Shipton Mill. Their organic flour is simply unsurpassed and is a joy to bake with. We have also taken delivery of a flour that will be exclusive to us. Grown up the road in Radford Semele it’s milled at one of the UK’s only surviving water mills in Hampton Lucy. It’s not just the fact we can count the food miles of this flour on one hand that attracted us, it’s also the wonderful and distinctive taste that we are weaving into our test bakes. 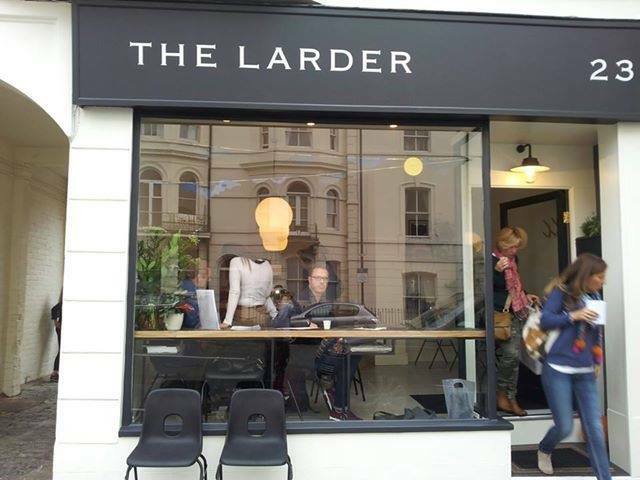 In Leamington Spa there is huge choice of cafes and coffee shops, so I was keen to find out what made The Larder different. At The Larder you can cluster around the grey slate topped table and help yourself to a selection of fresh, great quality food. 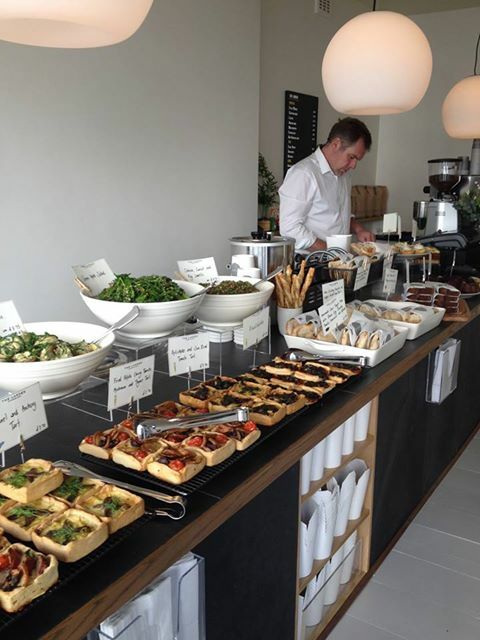 The bread, hot and cold sandwiches, puff pastry and cakes are all lovingly handmade in the downstairs kitchen, where all of the family get involved. 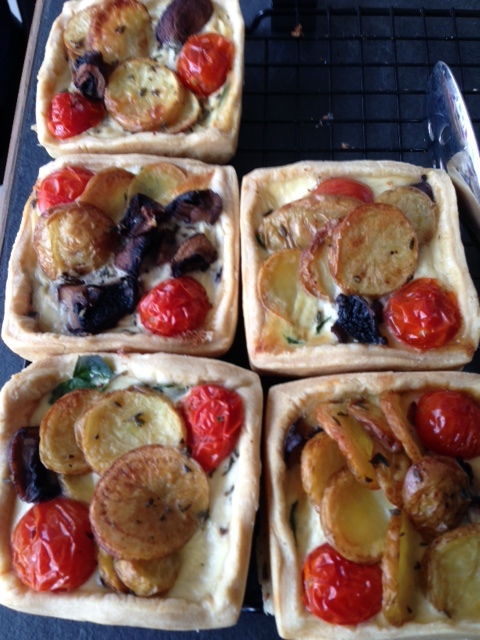 The idea for The Larder came from catering for friends and requests for cakes. 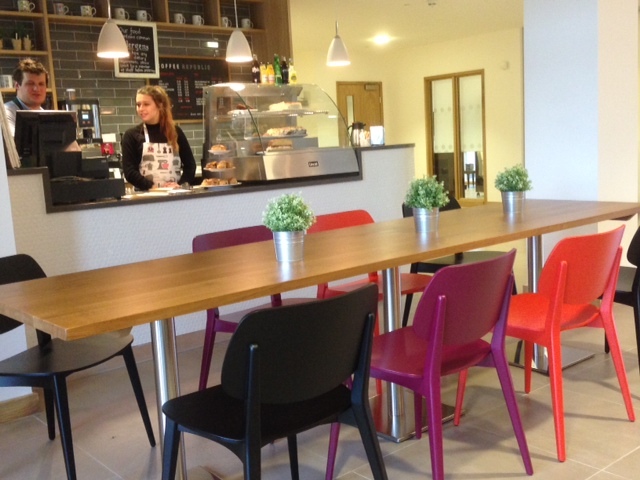 Recommendations spread to friends of friends until a dedicated kitchen and café was needed, which they found at 23 Portland Street in Leamington Spa. Influenced by Ottelenghi salads, the Mediterranean influences shine through, with a weekly changing menu. 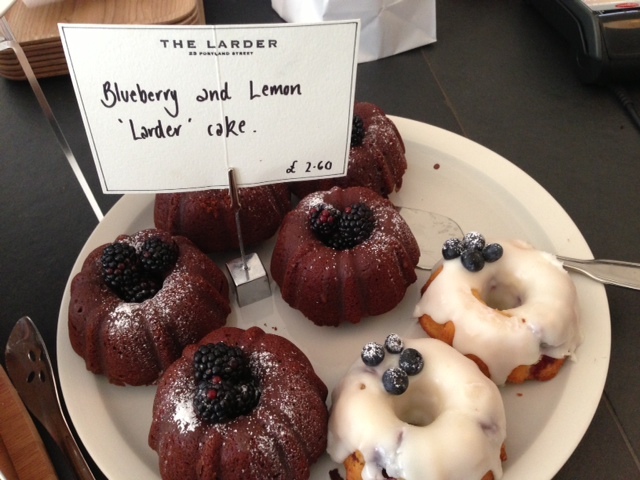 The Larder’s signature dish is the bundt cake and after trying the lemon and blueberry flavour I am now a fan! Last night I went to the new night market in Leamington Spa’s old town. As the night drew in, a warm cup of mulled wine from The Grand Union bar was very welcome while browsing the 20 or so food, drink, arts and crafts stalls. 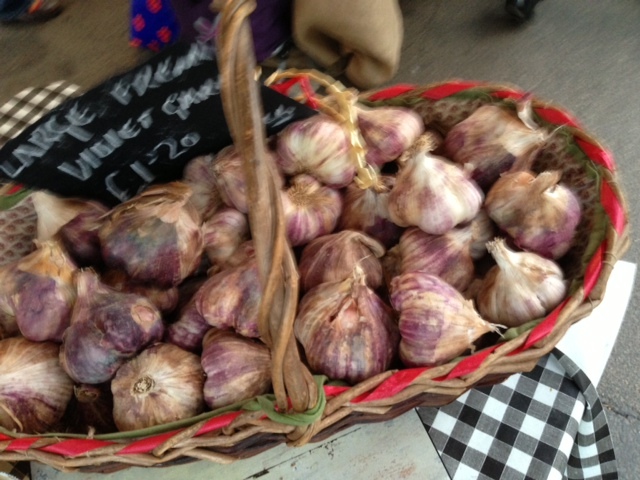 The aroma from this roasted garlic was amazing. 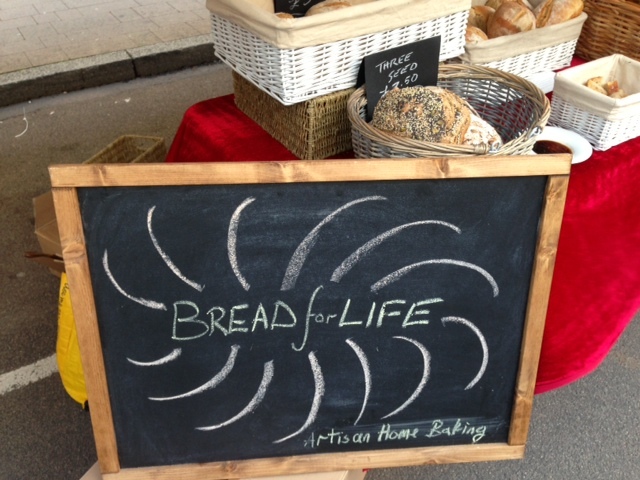 Bread for Life is an artisan baker based in Leamington Spa. 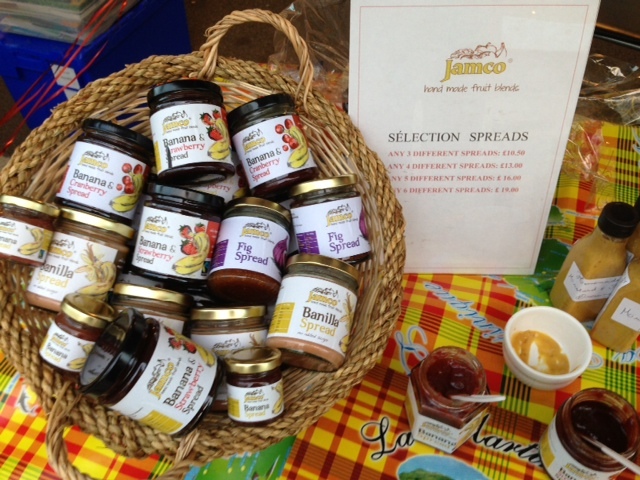 A selection of banana preserves from Jamco. 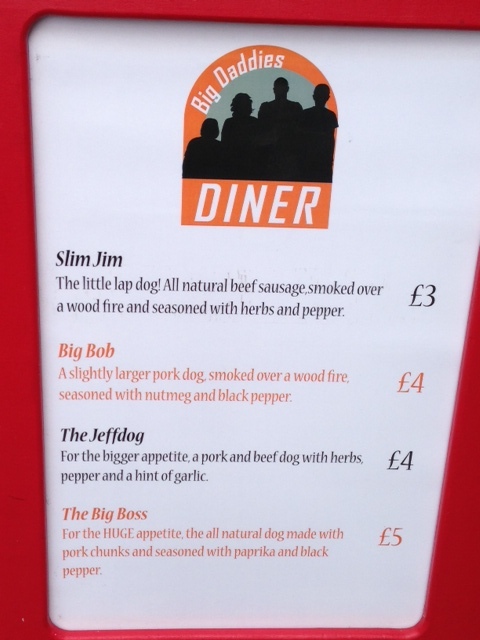 Street food favourites The Big Red Pig and Daddies Diner had spent all day at Eat Street in Regents Court, then moved round to Clemens Street for the evening. I had to stop at the cute Split Screen Bakery who were serving coffee and Halloween themed cupcakes. The market will run every Friday night from 4 – 9pm until Friday 29 November.